Our summer in the Catskill Mountains, to date, has been glorious and relaxing – well, up to a point. Remember, there is a wedding taking place near the end of August and we're busy with that. As mentioned in a previous post, grocery stores are few and far between in this region, and Armenian-Middle Eastern stores are even more elusive. We were able to secure a few items in town – Bulgarian Feta cheese, pine nuts, currants, and even jars of grape leaves. My sister and brother-in-law, thankfully, drove up from NJ to visit, bringing my shopping list of Armenian items – various sizes of bulgur, basturma, chorag, apricot leather, lahmajoun, and such. Mandy, the bride-to-be, has requested that Midia Dolma be served at one of the pre-wedding gatherings. 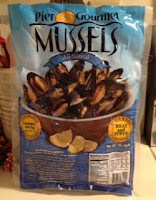 Problem – where do we find mussels in the mountains? Problem solved – at a grocers in Catskill, NY, about 40 minutes away. BUT, they’re not fresh; they’re in their shells, pre-cooked and frozen in brine. We bought what we could find. 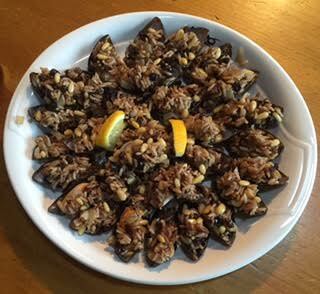 We were forced to experiment in advance by altering our recipe for Easy Midia Dolma and crossed our fingers that it would be edible. A. Stovetop: empty contents of pouch into a saucepan and cover. Heat on high until mussels open, about 8-10 minutes. B. Microwave: cut a small hole in pouch. Place pouch in microwave with the hole facing upward. Heat until mussels open, about 5-6 minutes. NOTE: Since there was no mention of what power level to use for the microwave, I cooked the mussels on the stove and they came out great. Once cooked, I removed the beards, and strained the mussel liquid through coffee filters into a bowl adding enough water to create one cup of cooking liquid for the rice. 1. In a medium saucepan, sauté onion in oil until softened, but not brown. 2. Add rice and water to the onion. Add seasonings. Mix. 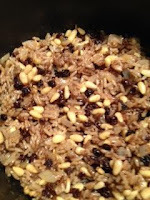 Cover and cook until rice is tender (about 15-20 minutes). 3. Stir in currants and pine nuts to cooked rice. Adjust seasonings, if necessary. 4. Add lemon juice to the mixture. 5. Place about 2 tsp. of filling on each mussel. Arrange on a serving platter. 6. Cover and chill until ready to serve. For best flavor, make a day in advance. 7. Garnish with lemon wedges. 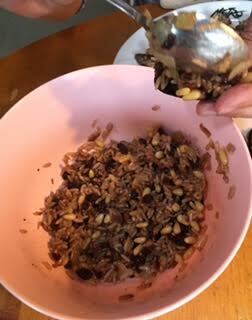 Taste Evaluation: Mandy, our main critic, gave this version of Midia Dolma an enthusiastic 2 thumbs-up!! If the mussels are pre-cooked, I would definitely use the mussel brine rather than plain water to make sure the flavors mix. Looks delicious! 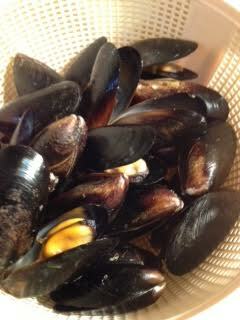 Yes, Ara, they were pre cooked & the mussel brine enhanced the flavor of the rice nicely!